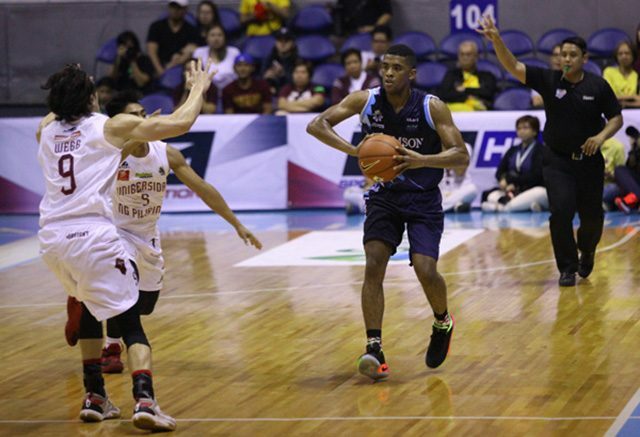 Fans of the Adamson University Soaring Falcons and University of the Philippines Fighting Maroons are bracing for their do-or-die semi-final matchup on Wednesday to decide the final ticket to the University Athletics Association of the Philippines Season 81 men’s basketball finals. The Soaring Falcon’s found an easy way to free up their schedule on Wednesday after the school’s administration suspended its afternoon classes on campus to allow students and staff to support the team. “We are appealing to the entire AdU Community to support our team. Please wear navy blue Adamson U shirts,” Adamson University President Marcelo Manimtim said in a statement. The Fighting Maroons on the one hand will be having a send-off mass for its players on Tuesday a day before the game. The Nowhere to Go but UP Foundation which assists the state university’s varsity teams also announced that it will be putting up screens inside the campus so that those unable to purchase tickets can tune in to the game. The Araneta Coliseum’s ticketing office confirmed that tickets for the game were already sold out as early as Monday, two days before the scheduled showdown. UP Faithful, we need you now more than ever. Be there on Wednesday and color the stands Maroon as we battle it out against the Adamson Soaring Falcons for the right to play in the finals. Call all Adamsonian Alumni, Students and Fans, TICKET SELLING ONLINE will be after the game of Ateneo and FEU later at 6-7pm. Please SECURE TICKETS RIGHT AWAY! It's also official, LET US PAINT THE TOWN BLUE 💙💙💙. Wear your BLUE SHIRTS on WEDNESDAY! The tension has spilled over to fans in the social media arena. The first game of the semi-final series saw UP’s recently-crowned Most Valuable Player Bright Akhuetie sink a sneaky basket from an inbound pass to give the Maroons a 73-71 win. The extraordinary excitement shown by the schools’ fans stems from their shared history of struggling in the men’s basketball arena. Adamson, who last won the title in 1977, was rarely seen as a threat when the UAAP implemented the Final Four format in the 90’s. It made its first appearance in the league’s podium in 2006, 12 years after the Final Four format was implemented, but lost to the Ateneo Blue Eagles. It returned to the Final Four in 2010 but once again failed to advance. In 2011, the Falcons finished second in the elimination round to clinch the twice-to-beat advantage in the semi-finals, but were upset by the Far Eastern University Tamaraws. The Falcons spent the next few seasons in futility, finishing in last place in 2014 and 2015. Their fortunes turned when five-time championship coach Franz Pumaren decided to sign up with the team in 2015, promising them the elusive trophy. With the help of rising stars in Papi Sarr, Jerrick Ahanmisi and Sean Manganti, Pumaren led the team to the Final Four from 2016 to 2018. UP, who last won the trophy in 1986, had a more promising start in the Final Four era, making the post-season in 1996 and 1997. The team however for the next 21 years struggled to find success. From 2007 to 2013, the team finished in last place six out of seven times. In 2014, it put an end to a 27-game losing streak that spanned two seasons when it defeated the Falcons. The team’s success has been credited to new talent such as Paul Desiderio, brothers Juan and Javi Gomez de Liaño and MVP Akhuetie under the tutelage of former PBA coach Bo Perasol. The Maroons are expected to remain a powerhouse when blue-chip acquisitions former De La Salle star Ricci Rivero and former US NCAA player Kobe Paras are declared eligible to play in 2019 after serving out their residency year.